A portrait of the American landscape that shows how geography continues to determine America’s role in the world, from the author of Balkan Ghosts. For those who feel disoriented, and also (perhaps especially) for those who feel triumphant, Robert D. Kaplan’s small but magisterial new book, Earning the Rockies, is a tonic, because it brings fundamentals back into view. With only 180 uncrowded pages of text, this is a book that can be read on a coast-to-coast flight, but fully digesting it will take much longer. Every page brings a fresh insight, a telling aperçu, a bracing reality check ... a musing travelogue, one that seeks, in words as carefully chosen as gemstones, to bring America’s geographic and geopolitical fundamentals back into the picture ... Kaplan embraces America’s quasi-imperial role but is no imperialist. His book is most challenging, and most valuable, for the layers of paradox it mines. Geography and union make the United States a hegemon whose auspices create the conditions for globalization — but globalization diminishes America’s geographical advantages and erodes American unity. Meanwhile, as globalization uproots local economies and norms, the communications revolution spawns new tribal and ideological identities, everything from jihadism to alt-right ... Earning the Rockies was written before the 2016 election. The name 'Trump' appears only a few times. Yet there is more insight here into the Age of Trump than in bushels of political-horse-race journalism...Where are we now? In territory that is uncharted but not altogether unfamiliar. President Trump may try to ignore the paradoxes of geography and globalism, but he cannot escape them. In the long run, Kaplan reminds us, the shape of the river constrains the pilot’s course. America will continue to lead, because it must. Kaplan observes that the conviction that America is exceptional 'emanates from the communal experience of settling a frontier,' and 'if this unending vastness could be conquered, then, after some fashion, the world could be, too' ... Kaplan does a good job of stimulating his readers' thinking about ways that national geography shapes national personality. By the time he reaches San Diego and gazes at part of the massive U.S. Pacific Fleet, he has seen much of America and his fellow Americans ... 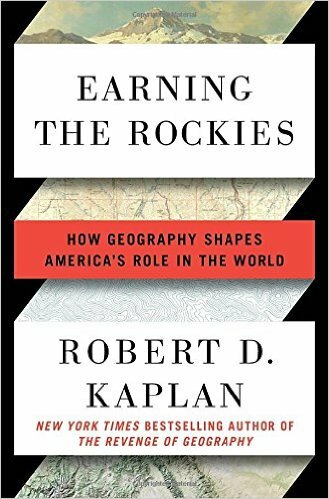 In Earning the Rockies, Robert Kaplan, always comfortable on a road less traveled, leads us toward a better understanding of how America's geography continues to shape this nation's role in the modern world. What did you think of Earning the Rockies: How Geography Shapes America's Role in the World?